As I am writing this article, I am happy to report that the temperature is a balmy 10 degrees Fahrenheit outside. The wind chill is -4. Last week, the wind chill hit -30 degrees. There is snow on the ground and it is cold. During this time of the year, you may have difficulty running outside. I personally enjoy running in the snow, but you may not have access to a convenient running location. Fortunately, there are several indoor conditioning options that you can use to crank up the intensity. Tabata intervals are just one example. The phrase Tabata interval originated from a study performed by Dr. Izumi Tabata (and colleagues) at the National Institute of Fitness and Sports in Tokyo, Japan. Below I have provided an abstract from this study. Effects of moderate-intensity endurance and high-intensity intermittent training on anaerobic capacity and VO2max. Tabata I, Nishimura K, Kouzaki M, Hirai Y, Ogita F, Miyachi M, Yamamoto K.
Department of Physiology and Biomechanics, National Institute of Fitness and Sports, Kagoshima Prefecture, Japan. This study consists of two training experiments using a mechanically braked cycle ergometer. First, the effect of 6 wk of moderate-intensity endurance training (intensity: 70% of maximal oxygen uptake (VO2max), 60 min.d-1, 5 d.wk-1) on the anaerobic capacity (the maximal accumulated oxygen deficit) and VO2max was evaluated. After the training, the anaerobic capacity did not increase significantly (P > 0.10), while VO2max increased from 53 +/- 5 ml.kg-1 min-1 to 58 +/- 3 ml.kg-1.min-1 (P < 0.01) (mean +/- SD). Second, to quantify the effect of high-intensity intermittent training on energy release, seven subjects performed an intermittent training exercise 5 d.wk-1 for 6 wk. The exhaustive intermittent training consisted of seven to eight sets of 20-s exercise at an intensity of about 170% of VO2max with a 10-s rest between each bout. After the training period, VO2max increased by 7 ml.kg-1.min-1, while the anaerobic capacity increased by 28%. In conclusion, this study showed that moderate-intensity aerobic training that improves the maximal aerobic power does not change anaerobic capacity and that adequate high-intensity intermittent training may improve both anaerobic and aerobic energy supplying systems significantly, probably through imposing intensive stimuli on both systems. Tabata intervals consist of 20 seconds of maximum intensity exercise, followed by 10 seconds of rest. This cycle is repeated 8 times (for a total of 4-minutes). Although Dr. Tabata used a mechanically braked cycle ergometer, you can apply this protocol to almost any exercise. 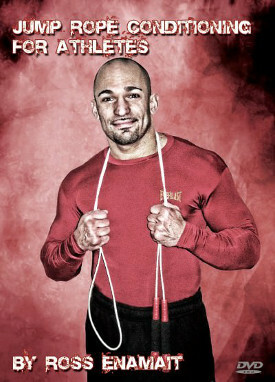 A few popular examples include hitting a heavy bag, sprinting, jumping rope, or performing bodyweight calisthenics (ex. squats and pushups). It is important to note however that changing the exercise used during the interval session may change the focus of the session. For example, working with a bodyweight exercise such as pushups or squats will shift the workout’s focus towards strength endurance. Here is one related discussion from the forum. Assuming that you put forth a maximal effort, you will be surprised at how intense 4 minutes of exercise will feel. These intervals are both taxing and time efficient. Such intense work is excellent for those athletes involved in sports such as boxing, MMA, or wrestling. As for the initial study, after 6 weeks of testing, Dr. Tabata noted a 28% increase in anaerobic capacity along with a 14% increase in V02Max. These results were witnessed by physically fit athletes. Many tests are conducted on deconditioned subjects, which leads to results that are difficult to evaluate. Dr. Tabata’s test was much more effective, as it produced a positive response on individuals who were already in shape. This form of training is also effective for fat loss. Intense interval work will raise the body’s metabolic rate long after the exercise session is completed. Post workout fat loss is the end result. Many recent studies have confirmed that the powerful “after-effect” of interval training is more effective (for fat loss) than low-intensity, continuous exercise. Such research assumes that a true maximal effort is applied however. Interval training is like many things in life, you get what you put into it. The Tabata protocol can be applied to almost any exercise. The most obvious choice is outdoor sprinting. For example, sprint 20 seconds, then rest (walk) 10 seconds, and continue until you have completed 8 x 20 second sprints. Always begin with a moderate warm-up and cool down session. A winter friendly option can include a variety of exercises. Below I have provided one sample workout. This workout will consist of 4 separate Tabata intervals, each consisting of 4 minutes. The total workout will last 16 minutes. You can perform this workout indoors. Clearly, the workout varies from the initial study, so you cannot expect identical results. The 20/10 second work-to-rest ratio is rather convenient however. You can easily time this workout with a large digital clock or personal interval timer such as the Gymboss. Another useful Tabata workout can be performed on the heavy bag. Punch non-stop for 20-second intervals, followed by 10 seconds of rest. You will be surprised at the difficulty of this 4-minute heavy bag session. Fighters could use this protocol as a finisher to a more comprehensive skill session (ex. after sparring or traditional bag work, finish with one round of Tabata intervals on the heavy bag). In summary, incorporate variety into your interval workouts, both in terms of exercise selection and work-to-rest ratios. The Tabata protocol is just one of countless options.